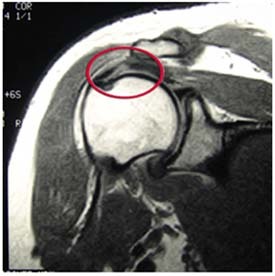 Rotator cuff tears are common injuries, especially among active middle age men. As researchers and scientists seek for better ways to promote healing and more optimal surgical outcomes, PRP continues to get lots of attention. If you want a basic primer on PRP, click here to read one of my earlier posts on it. In a recent study in the October 2011 American Journal of Sports Medicine, researchers looked at the effects of PRP on patients undergoing surgery for full thickness rotator cuff tears. This is the first prospective cohort-control study to investigate the effect of PRP gel augmentation during arthroscopic rotator cuff repair. Forty two patients were included in the study (average age of 60), with 19 undergoing arthroscopic repair with PRP and 23 without. Outcomes were assessed preoperatively and at 3, 6, 12, and finally at a minimum of 16 months after surgery (at an average of 19.7 +/- 1.9 months) with respect to pain, range of motion, strength, and overall satisfaction, and with respect to functional scores as determined using multiple assessment tools. At a minimum of 9 months after surgery, repaired tendon structural integrities were assessed by magnetic resonance imaging.